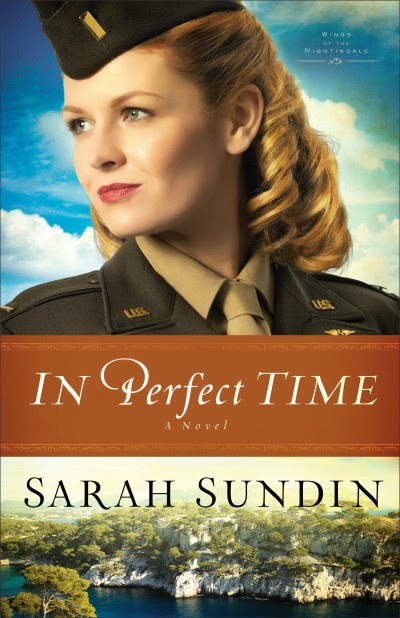 I have fallen in love with Sarah Sundin's World War II novels. That just had to be stated up front. In Perfect Time is the third (and final, apparently) novel in the Wings of the Nightingale series, and I do think it was the best of them all. This series has followed a group of flight nurses who are stationed in Europe. Each novel focuses on one of the nurses, and her romantic interest. The first two novels were fantastic and I dearly loved the two nurses and the men they fell in love with. There was one nurse, though, who I just didn't like. She's the main character in this final book. Part of me didn't even want to read this because of that. I have to confess that. But Sundin weaves in so much "what happens next" from the other two nurses' stories, that I wanted to read that part. I knew that this story would be like the others -- very solid on real, historical facts with a focus on some of the lesser-known events and roles. I knew I'd be pulled into the storyline, really feeling like I was there. And seeing as it is Christian fiction, I figured that I could rejoice when that obnoxious flirt, Kay Jobson finally found God. I didn't expect to find myself identifying with Kay. I especially liked the emphasis on "earning" favor from God. That came up over and over. God doesn't give us blessings because we are good. He gives them because He is good. One "complaint" of sorts with this series is that you just know the romance thing is going to work out. That is never really in doubt. What is not so clear is just how that will happen. Another thing to know going into the book is that the books in this series overlap some. That threw me off in Book 2, as some of the events from Book 1 hadn't happened yet as Book 2 started. Same for this one, Book 3. Some of the things that occurred in Book 2 happened again near the beginning of In Perfect Time. This time, they happen from Kay's (or Roger's) point of view. I like that, as it helps to bring me back up to speed on who everyone is, since it has been a few months since I read the last book in the series. All in all, I simply love this book. Sarah is celebrating the release of her book with a fun giveaway! Debra - thank you so much for the lovely review! I'm glad you came to like - even identify with - Kay. I did too. Yes, this is the last Nightingale book, but I have another three-book contract with Revell for the Waves of Freedom series, which follows three American naval officers based in Boston in WWII. Odyssey Adventure Club giving away an iPad Mini!